This project aims to reduce the damage by wild fires to the forest habitat of the critically endangered Amur Leopard in Southwest Primorye in the Russian Far East. Human-caused ground fires are slowly destroying forest habitat of the Amur leopard in Southwest Primorye without which this rare cat will not survive. Satellite monitoring indicates that approximately 50% of Southwest Primorye burns at least once every 10 years. Recurrent fires over the past century have converted what should be a luxuriant forest of mixed coniferous and deciduous trees into grasslands. Today, only 57% of Southwest Primorye remains forested. The fires destroy habitat for highly endangered species such as Amur tigers and leopards and have negative impacts on human health and the local economy. All over Russia, such fires are increasingly recognized as a serious problem and an important source of black carbon emissions contributing to global warming and melting of the Arctic permafrost ice. Our collaborative Fire Management Program is an attempt to coordinate NGOs, regional and local governments and protected areas in developing a comprehensive response to seasonal ground fires. We have focused our efforts on two model areas: 1) west part of Slavyanka Municipality in co-operation with the municipality authorities (orange area on map) and 2) part of the Leopardoviy Wildlife Refuge in co-operation with our local partner Phoenix Fund and the management of the Kedrovaya Pad – Leopardoviy Protected Area (purple area on map). Increase effectiveness of fire fighting through creation of well-equipped and well-trained fire fighting brigades. Create a system of firebreaks to halt the spread of fire. Appoint local fire wardens in communities to prevent illegal burning of fields and vegetable gardens. Stimulate prosecution of perpetrators who started illegal fires. Through social research, identify strategies for behavioral change in local people to halt human-caused ignitions. Increase public awareness with use of brochures, posters, road signs, newspaper articles, television broadcasts and an awareness campaign in local schools. Conduct technical exchanges with US Forest Service specialists who provide advice to WCS staff and project partners.. Develop a manual describing fire management approaches that have proven effective in our model areas and lobby local and federal authorities to adopt these ‘best practices’. A fire brigade has been created through a cooperative agreement between Slavyanka Municipality and WCS. Recently a second brigade has been created to work further north in the Leopardoviy Wildlife Refuge. Five fire wardens in small settlements in Slavyanka Municipality educate villagers about fire safety regulations, report fires to the fire-fighting teams and assist police in collecting the evidence needed for prosecution of people who have started fires illegally. This approach has reduced the formerly very frequent fires in and near these small settlements to almost zero. Social surveys indicate increasing concern about fires in the locality. 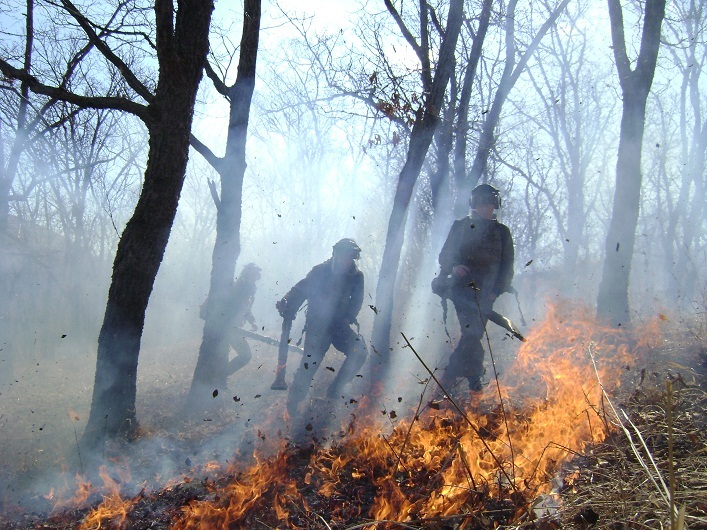 We reduced the area that burned in our 280-km2 Slavyanka model area by 83% in 2010, 99% in 2011 and 80% in 2012.